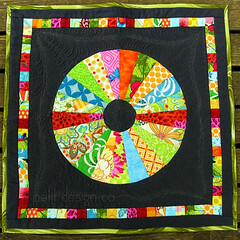 The time is upon us once more for the spring Blogger's Quilt Festival. Basically it's a giant online quilt show. Free of charge and in your jammies if you so desire! You can find all of the other participating blogs at Amy's Creative Side. I want to share my latest finish with you. This is "Heidi's Quilt"
This is my first official completely quilted on my frame quilt that did not end up with an all over stippling. I learned a ton in making this quilt. Like the importance of squaring up your finished blocks when you're dealing with so many different types of fabrics. Or how long it actually takes to do custom quilting. I very naively thought I'd finish up the quilting in a day. Well I worked on this quilt for about 4 days (don't forget I'm pregnant and have 2 little ones) and used a whopping 8.5 bobbins (these are larger than domestic sewing machine bobbins.) I also learned that your hands get sore from quilting for so long! Oh and I even had to rotate the quilt to get all of the sashings done. It's not perfect but I love the end result and I know my friend loved it. I was so glad I was able to give it to her in person last week. That was the icing on the cake for a project that was lots of work. And here's a close up of the quilting. Feel free to look around my blog and take a look at my other recent love. PS you can visit my other blog Quilty Giveaways to find the latest quilt related giveaways going on in bloggy land. es uno de mis favoritos y yo creo que las telas de las camisas le quedan perfecto! buen trabajo de quilting Norma! Well worth all the effort - absolutely stunning. A wonderful gift for your friend. This is a really beautiful quilt and a loving gift. Love the stars! I'm sure this soft and beautiful quilt filled with meaningful fabrics will give comfort to your friend during this difficult time. It's such a beautiful and peaceful quilt! What a beautiful memorial quilt. I loved it when I first saw it in the mini pics and I love it even more after I read about it. Your friend must love wrapping up in it. You are so sweet to do this for your friend- it will be a gift she will always treasure. What a lovely remberance for your friend and an inspiration for us that you have shared it. It is fantastic! You did a great job. This quilt is beautiful, and a wonderful gift for your friend to cherish. 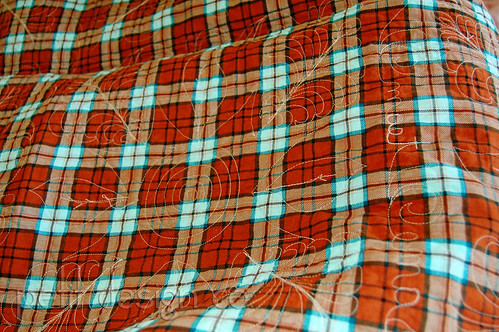 Its a beautiful quilt and one to be treasured - which I am sure it will. Well done. What a poignant story, and it turned out beautifully. Your quilting looks terrific - you even put words in there~! You picked a great pattern to combine all the shirts. It is beautiful and such a gift of love. This is the most beautiful memory quilt I've ever seen. You did a brilliant job on this! Agree with everyone, fantastic memory quilt. I love the swirl quilting on the stars, so pretty. It's beautiful! You did an amazing job!!! Love the quilt and the fact that it's made with your friend's husband's shirts. I know she will cherish the quilt. And the quilting is AMAZING from the back. Nicely done. What a crisp and bright memory quilt. Love your quilting. Congrats on a fine job. What an amazing gift for your friend. I know it will be treasured by both her and her daughter. That is a great quilt! First I went looking for the pattern...thank you for the referral. Then I saw the link for your other site. My goodness! Did I ever get derailed over there! 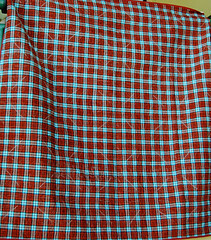 The quilting was worth the effort it is beautiful. 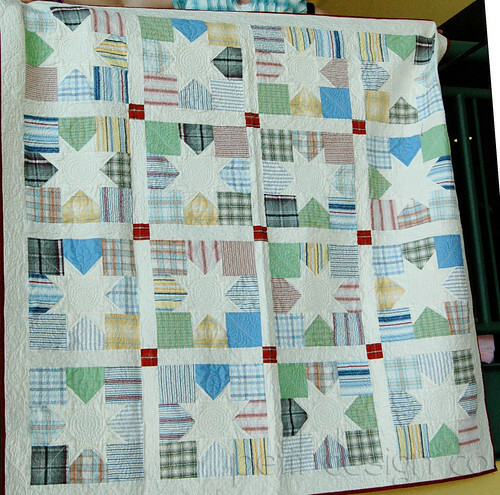 What a lovely quilt and lovely story behind it, a gorgeous keepsake to have! This quilt is grogeous! I love the wagon wheelish looking one too. I hope you have a better week going forward and best wishes for the a lovely birth to welcome your new baby. What a wonderful quilt! What a beautiful gift for your friend.